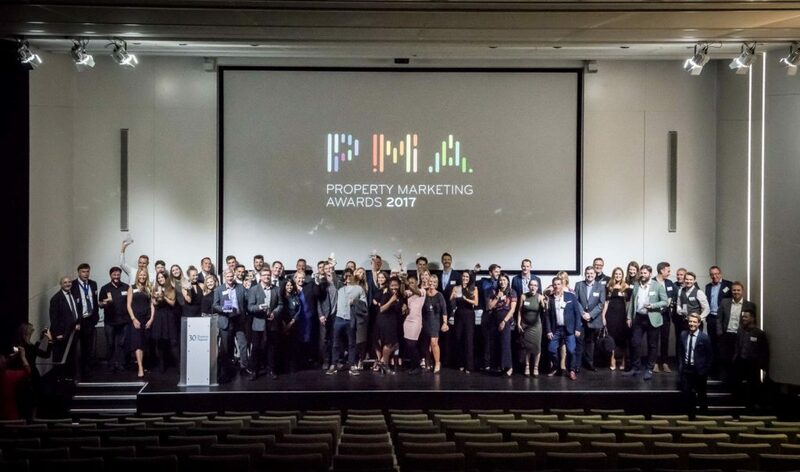 London, 20th June 2018: London based specialist property marketing agency Key Property Marketing were the runaway winners with joint venture partners Peabody & Hill at this year’s Property Marketing Awards. Their marketing campaign for East London project Fish Island Village won the team awards in two categories Residential New build and Residential Regeneration, a commendation in the Best Place-Making category – and the ultimate prize of the night, the Grand Prix. The judges commented that their work was innovative, authentic and professional, with great results. Other big wins included the in-house marketing team at Carter Jonas who scooped the highly prized Property Marketing Team of the Year award. And last year’s team winners SEGRO who picked up the award for Best Thought Leadership. The prestigious Property Marketing Awards are organised each year by the Chartered Surveyors’ Company, a City of London livery company. The not-for-profit awards, held this year at 30 Euston Square and hosted by broadcaster Sophie Raworth, celebrate and encourage the very best in property marketing from around the UK. The shortlist includes some of the most talked about and successful marketing campaigns of the year. The PMA categories are judged by an independent panel of marketing professionals at the top of their respective fields, led by Thomas Brown, Founder of ThinkStuff. The awards are supported by generous industry sponsors including media partner EG. PMA 2019 will be open for online entries from January 2019. Follow the awards on Twitter @PropMarAwards.